The sociological domain is different from the psychological one insofar as meaning can be communicated at the supra-individual level (Schütz, 1932; Luhmann, 1984). The computation of anticipatory systems enables us to distinguish between these domains in terms of weakly and strongly anticipatory systems with a structural coupling between them (Maturana, 1978). Anticipatory systems have been defined as systems which entertain models of themselves (Rosen, 1985). The model provides meaning to the modeled system from the perspective of hindsight, that is, by advancing along the time axis towards possible future states. Strongly anticipatory systems construct their own future states (Dubois, 1998a and b). The dynamics of weak and strong anticipations can be simulated as incursion and hyper-incursion, respectively. Hyper-incursion generates “horizons of meaning” (Husserl, 1929) among which choices have to be made by incursive agency. The concept of information developed in this theory at first seems disappointing and bizarre--disappointing because it has nothing to do with the meaning, and bizarre because it deals not with a single message but rather with the statistical character of a whole ensemble of messages, bizarre also because in these statistical terms the two words information and uncertainty find themselves to be partners. Recent advances in the computation of anticipatory systems enable us to model both the generation of meaning by anticipatory agents and meaning-processing at the supra-individual level. Luhmann (1971, 1984, and 1986) proposed to consider the processing of meaning as the autopoietic operation of both social and psychological systems. Social and psychological systems are both structurally coupled and “interpenetrate” each other reflexively (Luhmann, 1977). Interpenetration adds an operational dimension to the structural coupling between social and psychological systems (Luhmann, 1988 [1995a, at p. 51; 2002, at p. 182]). In this study, we submit operationalizations of these various concepts in terms of the theory and computation of anticipatory systems (Rosen, 1985; Dubois, 1998a; Leydesdorff, 2008, 2009). Meaning can first be provided to events by reflexive systems (e.g., observers) from the perspective of hindsight (Rosen, 1985). Human languages allow additionally for the construction and exchange of models using metaphors (Luhmann, 1995a, at p. 44; 2002, at p. 175; Leydesdorff & Hellsten, 2005). Metaphors enable us to communicate meaning (Lakoff & Johnson, 1980; Hesse, 1988; Maasen & Weingart, 1995). New meaning can also be generated as a result of inter-human communication (Schütz, 1932; Mead, 1934). When expectations are exchanged and interact, one can expect the development of a non-linear dynamics of meaning-processing on top of the information exchanges (MacKay, 1969; Maturana, 2000). Meaning is interactively and recursively reconstructed, but in an intentional mode, i.e., with reference to a future state (Husserl, 1929; Schutz, 1975). In the case of Equation 1, the selection pressure (1 – x) on the variation (x) develops synchronously with the recursive development of the system. For example, markets select technological innovations in terms of current prices, while competing technologies can be expected to develop with reference to their previous states. Equation 2 has two roots: x = (a – 1)/a, and x = 0. These roots are the steady states of the logistic equation and the models of anticipatory systems that can be derived from it. These equations model a “strongly anticipatory” system. While “weakly anticipatory” systems entertain models of themselves, strongly anticipatory ones use expectations to construct their current state. In other words, the incursive and hyper-incursive analogues of the logistic equation provide us with a model of how social systems of expectations can be reconstructed on the basis of interactions among weakly anticipatory systems (Leydesdorff & Dubois, 2004). 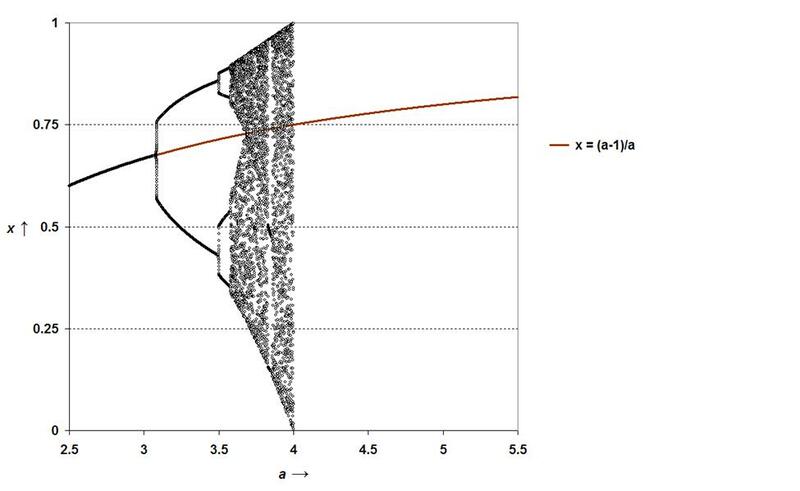 Unlike the logistic map, this anticipatory system does not bifurcate, but develops along the curve of the steady state—x = (a – 1)/a)—for all values of a. Figure 1 shows the results of the simulation. The biological variation bifurcates and increasingly generates chaos for 3.57 < a < 4, while the anticipatory system grows continuously to the limit value of x = 1 with increasing values of a. Figure 1: The steady state of the weakly anticipatory system. The line penciled into Figure 1 can be considered as an emerging axis stabilizing an identity among the reflections at each moment of time. The weakly anticipatory system provides meaning to the events by integrating them in both the biological domain (a < 4; e.g., bodily perceptions) and the social domain of meaning-processing (a ≥ 4). This integration of the different representations functions as a linchpin for developing a strongly anticipatory system in the cultural (i.e., non-natural) domain of meaning-processing (a ≥ 0.4). The hyper-incursive Equations 3, 4, and 5 provide us with the three building blocks of a non-linear dynamics of expectations (May, 1976; May & Leonard, 1975). Equation 3 first evolves into x = (a – 1)/a. This is equal to the steady state of the weakly anticipatory system. In other words, weak anticipation can be considered as one of the sub-dynamics of a strongly anticipatory system. In Luhmann’s terminology, one could perhaps consider this correspondence as the re-entry of the first-order observation into the system of second-order observations (Luhmann, 1993 ). Equation 4 evolves into xt+1 = (1/a) [xt / (1 – xt)]. This routine formalizes the reflexive operation: when xt > [a / (1 + a)] a pulse is generated which first overshoots the value of one, but then generates a negative value (Figure 2). The negative value provides a mirror image of the representation at a specific moment in time, and thus allows for a reflection. Reflection enables a system to bounce a communication. Note that the combination of Equations 3 and 4 provides the weakly anticipatory system with reflexive access to the meaning processing at the supra-individual level. 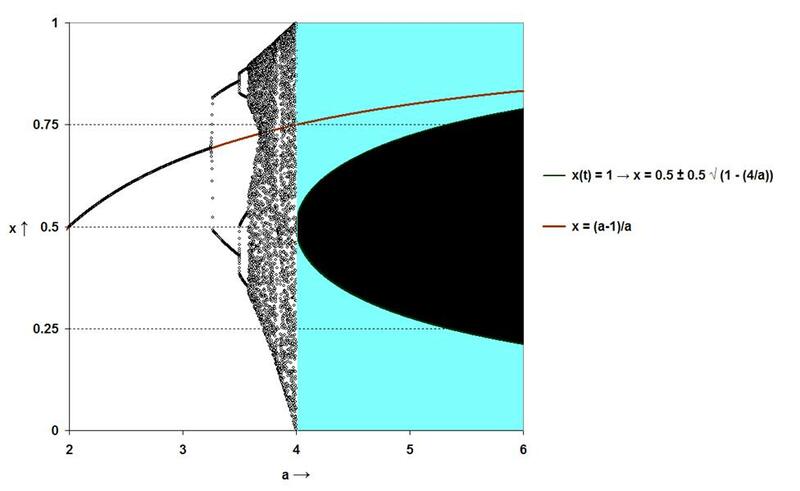 Figure 2: Simulation of Equation 4. Equation 5 invokes the perspective on social systems as introduced here: Ego and Alter are bound by a double contingency of expecting each other to be first historical and biological, but secondly reflexive and intentional (Parsons, 1968; Luhmann, 1984). Using the second layer of the double contingency, Ego in the present (xt) no longer refers to oneself as an identity which is rooted in the past, but to oneself in a future state (xt+1), that is, as an Alter Ego. The non-linear interactions among expectations can generate the social world as a system different from psychological ones. However, this social system of expectations remains structurally coupled to psychological ones; otherwise, nobody would be able to articulate the “horizons of meaning” which are generated. Given that 0 ≤ x ≤ 1, the curve x = 0.5 ± 0.5 √ (1 – (4/a)) for x = 1 sets limits to the possible values reached by the social system (Figure 3). Figure 3: The social system as a result of hyper-incursion. For a ≥ 4, two sets of expectations are generated at each time step depending on the plus or the minus sign in the equation. After N time steps, 2N future states would be possible. Thus, the social system of expectations needs continuously a mechanism for making decisions between options because otherwise this system would rapidly become overburdened with uncertainty. Figure 4: Possible penetrations of the social system into the biological variation (a < 4). The term under the root in Equation 6 is positive for xt ≤ a/4: this condition is met for a ≥ 4, but sets a borderline to the possible penetrations of the social system into the biological variation (a < 4). 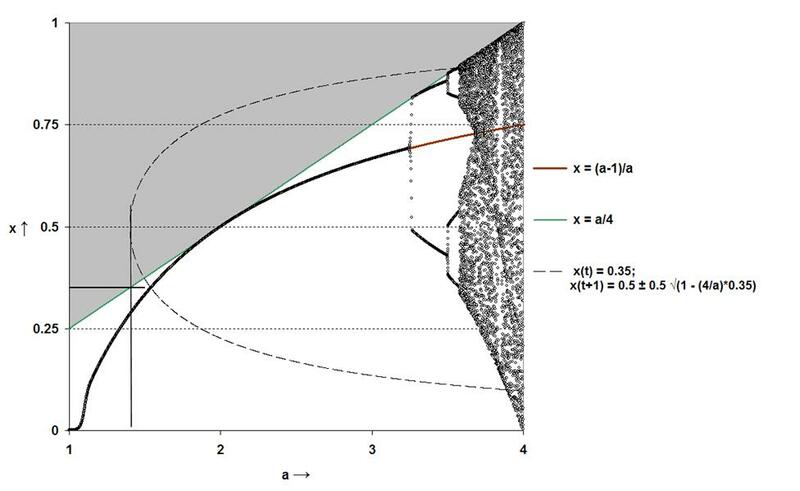 In Figure 4, this limitation is elaborated for a = 1.2 and xt = 0.35. Since in a next step xt+1 = 0.5, and thus larger than a/4 (= 0.3), the strongly anticipatory system would not be able to proceed with a next step to xt+2. Expectations cannot operate on expectations for a < 4, but next states of the natural system can be constructed on the basis of expectations like in the case of the socio-economic construction of technologies (Leydesdorff, 2006). The social system cannot further be developed at a ≥ 4 without a form of agency taking decisions because of the continuous production of uncertainty by the hyper-incursive mechanism (Eq. 5). Luhmann (2000) identified decisions as structuring organizations. Although this reflexive capacity is conceptualized by Luhmann as endogenous to the social system, organizations can also be attributed with institutional agency. A psychological system can then perhaps be considered as the minimal unit of reflection for making choices (Habermas 1981; Leydesdorff 2000, 2001). If decisions are socially further organized—for example, by using decision rules—an institutional layer can increasingly be shaped. The institutional layer provides a retention mechanism for the next round of expectations (Aoki 2001; Luhmann 2000). Thus, the social system is dually layered as a forward-moving retention mechanism and sets of possible expectations which flow through the networks. These “horizons of meaning” are not given, but continuously undergoing reconstruction (Luhmann 1990, 2002). The strongly anticipatory system is not autonomous, but autopoietic since structurally coupled to the layer of decision-making by weakly anticipatory agents (Collier 2006). Because the equations are derived from the same logistic equation, the steady states of the systems are equal: the systems are not only structurally coupled, but also coupled in terms of their reflexive operation. As noted, Luhmann (1977, 1995a ) reserved the term “interpenetration” (Parsons, 1968, at p. 473; Luhmann, 1978) for this additional dimension in the coupling. Interpenetration is possible because of the evolutionary achievement of developing human language ((Luhmann, 1995a, at p. 44; 2002, at p. 175; Leydesdorff 2002). Communication provides the strongly anticipatory system with one degree of freedom more than the weakly anticipatory ones. Unlike individuals, the social system can be expected to remain distributed. The uncertainty in the double contingency (Equation 5) is reproduced by the system and this makes the hyper-incursive anticipations unstable flows of communication. Figure 5: Trajectory of a social system based on random decisions of the decision-making units, for various values of the bifurcation parameter a. Figure 5 shows a simulation of trajectories for different values of a where decisions are taken randomly. The system sometimes dwells in a specific state. Next-order mechanisms like institutionalization can be expected to stabilize these configurations because decisions are then no longer taken randomly (Dubois 2001). Figure 6 summarizes the subdynamics which were distinguished above. While the weakly anticipatory system tends to integrate representations by organizing them into an identity, the strongly anticipatory one is based on uncertainty contained in the distribution. However, this additional degree of freedom cannot be used by this system without the mediation of agency using the additional coupling which is provided reflexively. The two systems are not only structurally coupled as systems, but also in terms of the reflexive operation of providing meaning to each other’s operations. The incursive and hyper-incursive equations provide us with models of meaning-processing at the individual and supra-individual levels. The incursive equation models the operation of a modeling system in relation to the modeled one. This corresponds with Rosen’s (1985) definition of an anticipatory system. The hyper-incursive equations enable us to model the structural coupling between historical phenomena and emerging horizons of meaning. Since hyper-incursion and incursion can recursively be applied to the results of the operations, the modeling and simulation of further codification of meanings (e.g., into discursive knowledge) becomes feasible. At the theoretical level, these algorithmic results can be appreciated with reference to the Habermas-Luhmann discussion (Habermas & Luhmann 1971) about communicative competencies (of agency) versus communication systems. The opposing perspectives in this debate can be considered as providing two geometrical metaphors to the algorithmic operations of the social system (Leydesdorff, 2000). Geometrical metaphors generate their respective “blind spots.” Habermas (1981), for example, shares with Giddens (1984) the assumption that the operation of the social system of expectations remains necessarily “virtual” and therefore unspecifiable. Luhmann (1984) specified this operation theoretically by proposing a deliberate abstraction from human agency (Luhmann, 1995b). Luhmann’s theory could be used fruitfully as a heuristics in these simulations. However, our results suggest that because of the complex relation between structural coupling between the two types of systems, and the interpenetrating reflection of their mutual operations, decision-making and therefore agency can be considered as back on stage. This is endogenous to the system and can also be appreciated as a re-entry. In Luhmann’s theory, the social system is considered as operationally closed and this organizational reflection can only be formulated as re-entry. However, the alternative perspective of considering the system as semi-autopoietic (since dependent for its further development on human or organizational reflections and agency) remains also possible. An advantage of this latter perspective may be that it is more compatible with mainstream sociological theorizing by appreciating reflexive agency while keeping the surplus value of Luhmann’s theory. Aoki M. 2001. Towards a Comparative Institutional Analysis. Cambridge, MA: MIT Press. Collier J. 2006. Conditions for Fully Autonomous Anticipation. In Computing Anticipatory Systems, CASYS’05, Dubois DM (ed). Melville, NY: American Institute of Physics Conference Proceedings; 839: 282-289. Dubois DM. 1998a. Computing Anticipatory Systems with Incursion and Hyperincursion. In Computing Anticipatory Systems, CASYS-First International Conference, Dubois DM (ed). Woodbury, NY: American Institute of Physics Conference Proceedings; 437: 3-29. Dubois DM. 2001. Theory of Incursive Synchronization and Application of a Chaotic Epidemic. International Journal of Computing Anticipatory Systems, 10: 3-18. Dubois, DM. 1998b. Emergence of Chaos in Evolving Volterra Ecosystems. In Evolutionary Systems: Biological and Epistemological Perspectives on Selection and Self-Organization, Van de Vijver G, Salthe S, Delpos M. (eds). Dordrecht, Boston, London: Kluwer Academic Publishers; 197-214. Giddens A. 1984. The Constitution of Society. Cambridge: Polity Press. Habermas J, Luhmann N. 1971. Theorie der Gesellschaft oder Sozialtechnologie. Frankfurt a.M.: Suhrkamp. Habermas J. 1981. Theorie des kommunikativen Handelns. Frankfurt a.M.: Suhrkamp. Hesse M. 1988. The Cognitive Claims of Metaphors. Joural of Speculative Philosophy, 2(1): 1-16. Husserl E. 1929. Cartesianische Meditationen und Pariser Vorträge. [Cartesian meditations and the Paris lectures.]. The Hague: Martinus Nijhoff, 1973. Lakoff G, Johnson M. 1980. Metaphors we live by: University of Chicago Press Chicago. Leydesdorff L, Dubois, DM. 2004. Anticipation in Social Systems: The Incursion and Communication of Meaning. International Journal of Computing Anticipatory Systems, 15: 203-216. Leydesdorff L, Hellsten I. 2005. Metaphors and Diaphors in Science Communication: Mapping the Case of ‘Stem-Cell Research’. Science Communication, 27(1): 64-99. Leydesdorff L. 2000. Luhmann, Habermas, and the Theory of Communication. Systems Research and Behavioral Science, 17(3): 273-288. Leydesdorff L. 2001. A Sociological Theory of Communication: The Self-Organization of the Knowledge-Based Society. Parkland, FL: Universal Publishers; at http://www.universal-publishers.com/book.php?method=ISBN&book=1581126956. Leydesdorff L. 2002. The Communication Turn in the Theory of Social Systems. Systems Research and Behavioral Science, 19(2): 129-136. Leydesdorff L. 2005. Anticipatory Systems and the Processing of Meaning: A Simulation Inspired by Luhmann's Theory of Social Systems. Journal of Artificial Societies and Social Simulation, 8(2), Paper 7, at http://jasss.soc.surrey.ac.uk/8/2/7.html [5 April 2007]. Leydesdorff L. 2006. The Knowledge-Based Economy: Modeled, Measured, Simulated. Boca Rota, FL: Universal Publishers. Leydesdorff L. 2008. The Communication of Meaning in Anticipatory Systems: A Simulation Study of the Dynamics of Intentionality in Social Interactions. In Proceedings of the 8th International Conference on Computing Anticipatory Systems CASYS'07, Dubois DM (ed). Melville, NY: American Institute of Physics Conference Proceedings (In print). Leydesdorff L. 2009. The Non-linear Dynamics of Meaning-Processing in Social Systems. Social Science Information, 48(1), forthcoming. Luhmann N. 1977. Interpenetration – Zum Verhältnis personaler und sozialer Systeme. Zeitschrift für Soziologie, 6(1): 62-76. Luhmann N. 1978. Interpenetration bei Parsons. Zeitschrift für Soziologie, 7: 299-302. Luhmann N. 1984. Soziale Systeme. Grundriß einer allgemeinen Theorie. Frankfurt a. M.: Suhrkamp. Luhmann N. 1986. The autopoiesis of social systems. In Sociocybernetic Paradoxes, Geyer F, Van der Zouwen J. (eds). London: Sage: 172-192. Luhmann N. 1988. Wie ist Bewusstsein an Kommunikation beteiligt? In Materialität der Kommunikation, Gumbrecht HU, Pfeiffer KL. (eds). Frankfurt: Suhrkamp; pp. 884-905. Luhmann N. 1990. The Cognitive Program of Constructivism and a Reality that Remains Unknown. In Selforganization. Portrait of a Scientific Revolution, Krohn W, Küppers G, Nowotny H. (eds). Dordrecht: Reidel; 64-85. Luhmann N. 1993. Die Paradoxie der Form. In Kalkül der Form, Baecker D. (ed). Frankfurt a. M.: Suhrkamp; 197-212. Luhmann N. 1995a. Soziologische Aufklärung 6. Opladen: Westdeutscher Verlag. Luhmann N. 1995b. On the Concepts “Subject” and “Action”. Preface to the English edition. In Social Systems. Stanford, CA: Stanford University Press; xxxvii-lii. Luhmann N. 1999. The Paradox of Form. In Problems of Form, Baecker D. (ed). Stanford, CA: Stanford University Press; 15-26. Luhmann N. 2000. Organisation und Entscheidung. Opladen: Westdeutscher Verlag. Luhmann N. 2002. How Can the Mind Participate in Communication? In Theories of Distinction: Redescribing the Descriptions of Modernity, Rasch W. (ed). Stanford, CA: Stanford University Press; 169–184. Luhmann N. 2002. The Modern Sciences and Phenomenology. In Theories of Distinction: Redescribing the descriptions of modernity, W. Rasch (ed). Stanford, CA: Stanford University Press; 33-60. Maasen S, Weingart P. 1995. Metaphors--Messengers of Meaning. Science Communication, 17(1): 9-31. MacKay DM. 1969. Information, Mechanism and Meaning. Cambridge and London: MIT Press. Maturana HR. 1978. Biology of language: the epistemology of reality. In Psychology and Biology of Language and Thought. Essays in Honor of Eric Lenneberg, G. A. Miller & E. Lenneberg (eds). New York: Academic Press; 27-63. Maturana HR. 2000. The Nature of the Laws of Nature. Systems Research and Behavioral Science, 17: 459-468. May RM, Leonard WJ. 1975. Nonlinear Aspects of Competition between Three Species. SIAM Journal of Applied Mathematics, 29(2): 243-253. May RM. 1976. Simple mathematical models with very complicated dynamics. Nature, 261(June 10): 459-467. Mead GH. 1934. The Point of View of Social Behaviourism. In Mind, Self, & Society from the Standpoint of a Social Behaviourist. Works of G. H. Mead. Morris CH (ed). Chicago and London: University of Chicago Press; Vol. 1: 1-41. Parsons T. 1968. Interaction: I. Social Interaction. In The International Encyclopedia of the Social Sciences, Sills DL (ed.). New York: McGraw-Hill; Vol. 7: 429-441. Rosen R. 1985. Anticipatory Systems: Philosophical, mathematical and methodological foundations. Oxford, etc. : Pergamon Press. Shannon CE, Weaver W. 1949. The Mathematical Theory of Communication. Urbana: University of Illinois Press. Spencer-Brown G. 1969. Laws of Form. London: George Allen and Unwin. [*] Amsterdam School of Communications Research (ASCoR), University of Amsterdam, Kloveniersburgwal 48, 1012 CX Amsterdam, The Netherlands, Email: loet@leydesdorff.net; Tel. : +31-20-525 6598; Fax: + 31-84223911. (1/a)[xt / (1 – xt)] = 1 for xt = a / (1 + a).